Innovation, Science and Economic Development Canada (ISED; legally, the Department of Industry; French: Innovation, Sciences et Développement économique Canada), is the department of the Government of Canada with a mandate of fostering a growing, competitive, and knowledge-based Canadian economy. ISED specifically supports Canadian innovation efforts, trade and investment, enterprise growth, and customized economic development in Canadian communities. ISED has three core responsibilities. These responsibilities are to oversee Canadian companies, investment and growth; people, skills and communities; and science, technology, research and commercialization. It addresses these responsibilities by doing work in four areas. These areas are research and development; economic development; market integrity, regulation, and competition; and internal services. This work is done by distributing grants and contributions, providing programs and services, managing federal activities, and overseeing relevant regulation and legislation. In order to fulfil this mandate among other responsibilities, ISED works in partnership with several organizations to address a broad and diverse range of economic variables across Canada. These organizations focus on specific geographic regions or economic variables with the collective goal of strengthening the Canadian economy. There are six regional development agencies under ISED's portfolio which provide tailored support suited to the strengths and needs of different areas of Canada. These agencies include: the Atlantic Canada Opportunities Agency, Canada Economic Development for Quebec Regions, Canadian Northern Economic Development Agency, Federal Economic Development Agency for Southern Ontario, Federal Economic Development Initiative for Northern Ontario, and Western Economic Diversification Canada. ISED is also associated with a number of special operating agencies, shared-governance corporations, departmental corporations, crown corporations, departmental agencies and a joint enterprise. The Department of Trade and Commerce was created in statute on June 23, 1887 and proclaimed into force on December 3, 1892. In 1969 the Department of Trade and Commerce was replaced by the Department of Industry, Trade and Commerce. In 1990, Industry, Science and Technology replaced Industry, Trade and Commerce. This new department also absorbed the offices of the Minister of Regional Industrial Expansion and Minister of State for Science and Technology. This marked the inclusion of regional approaches and scientific emphasis in the development of Canadian industries. In 1993, the department expanded its portfolio further to include Consumer and Corporate Affairs. 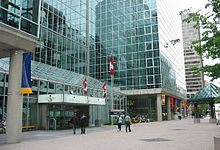 In March 1995, the department was renamed Industry Canada. Upon the November 2015 installation of the 29th Canadian Ministry led by Prime Minister Justin Trudeau, the position of Minister of Industry was renamed Minister of Innovation, Science, and Economic Development. Subsequently, applied title under the Federal Identity Program was changed from Industry Canada to Innovation, Science and Economic Development Canada. The Department headquarters are located at the C.D. Howe Building at 235 Queen Street in Ottawa, Ontario. Navdeep Bains is the minister assigned this portfolio. The current general mandate for the Minister of Innovation, Science and Economic Development is to "help Canadian businesses grow, innovate and export so that they can create good quality jobs and wealth for Canadians." The Minister's role is to work towards this mandate in collaboration with other Canadian governments, among other partners. In particular, the Minister of Innovation, Science and Economic Development works with the Minister of Science and the Minister of Small Business and Tourism. In this team, the Minister of Innovation, Science and Economic Development acts as a leader. Kristy Duncan is the minister assigned this portfolio. The current general goal for the Minister of Science is to "support scientific research and the integration of scientific considerations in our investment and policy choices." The Minister must work with other Ministers to support science-based decision-making that furthers wider governmental economic and environmental mandates. Mélanie Joly is the minister assigned this portfolio. Mary Ng is the minister assigned this portfolio. ISED oversees seventeen departments and agencies and is associated with an additional six organizations. Each of these organizations are related to one or more of the four focus areas of ISED: i) innovation in science and technology ii) trade and investment iii) growing small and medium-sized enterprises iv) economic growth of Canadian communities. The departmental legislation for ISED is the Department of Industry Act. The Act states that the Minister of ISED's objective is to use their role in order to "strengthen the national economy and promote sustainable development." The Act also outlines a number of supporting objectives. The Minister must also use their position to support domestic trade and support a healthy marketplace through investment and technology. In addition to the departmental legislation, ISED is also responsible for various legislation related to economic development, including: telecommunication legislation, marketplace and trade legislation, intellectual property legislation, consumer legislation, and other legislation governing general functions and agencies. ^ Treasury Board of Canada. (n.d.) Spending and Employment Trends. Retrieved from http://www.tbs-sct.gc.ca/ems-sgd/edb-bdd/index-eng.html#orgs/dept/130/infograph/financial. ^ "Public Accounts of Canada 2015 Volume II Section 16 - Industry Ministry summary". Government of Canada. 2015. Retrieved 21 Feb 2017. ^ Government of Canada, Treasury Board of Canada (2017-03-15). "Federal Identity Program registry of applied titles". www.tbs-sct.gc.ca. Retrieved 2019-04-07. ^ "Treasury Board of Canada Secretariat". Report on Plans and Priorities. Government of Canada. Retrieved 18 February 2013. ^ Treasury Board of Canada. (n.d.). Results. Retrieved from http://www.tbs-sct.gc.ca/ems-sgd/edb-bdd/index-eng.html#orgs/dept/130/infograph/results. ^ Innovation, Science and Economic Development. (2017). 2018-19 Departmental Plan. Retrieved from http://www.ic.gc.ca/eic/site/017.nsf/eng/h_07608.html. ^ Innovation, Science and Economic Development Canada. (2015).Ministers. Retrieved from http://www.ic.gc.ca/eic/site/icgc.nsf/eng/00024.html. ^ "Trudeau government renames key departments". CTV News. Retrieved 16 February 2017. ^ "What happened to Industry Canada? Trudeau elevates scientific research in new cabinet role". Financial Post. Retrieved 16 February 2017. ^ Trudeau, J. (2015). Minister of Innovation, Science and Economic Development Mandate Letter. Retrieved from http://pm.gc.ca/eng/minister-innovation-science-and-economic-development-mandate-letter. ^ Trudeau, J. (2015). Minister of Science Mandate Letter. Retrieved from http://pm.gc.ca/eng/minister-science-mandate-letter. ^ Innovation, Science, and Economic Development. (2016). Innovation, Science and Economic Development portfolio. Retrieved from http://www.ic.gc.ca/eic/site/icgc.nsf/eng/h_00022.html. ^ Innovation, Science, and Economic Development. (2016). List of Acts. Retrieved from http://www.ic.gc.ca/eic/site/020.nsf/eng/h_00612.html.